Pinterest is often poked fun at for being a complete waste of time. Once you figure out how the pins and boards work, it’s tough to break free from the Pinterest vortex. But, I’m committed to tackling some of my pinned projects! And that quote has been repinned 1,819 times, so clearly there’s some truth to it. I have pinned so many projects that I convinced myself I would tackle one day…. and most of those pins have just languished, waiting for me to look at them again. So, I’m beginning a series that I’m calling Pinterest in Practice. I’ll be peeking at my boards and tackling one project each week. I’m out to prove that the hours I spend on Pinterest aren’t a complete waste of time. For this week, I chose a project that I tweaked a bit to make it fit my needs. The original pin was for glittered recycled bottles, but I swapped those out for a candleholder that I had sitting around. Old newspaper or paper grocery bag cut open, to protect your work area and provide for easy clean-up (always important when using glitter). 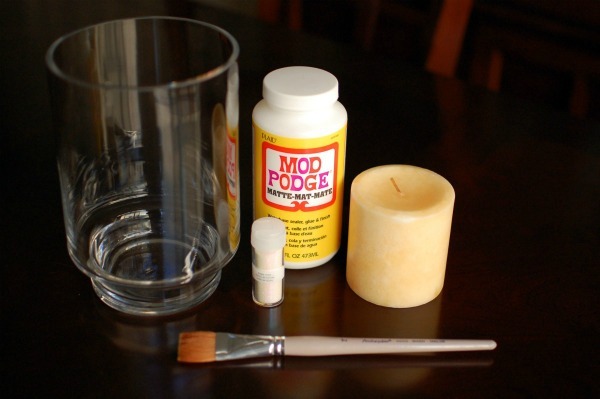 Clean your candleholder thoroughly with glass cleaner to remove any oily residue. Sprinkle glitter in a sweeping motion to fully cover the Mod Podge. Then add more for good measure. Allow to dry completely. Mine was dry within two hours. Shake, tap or brush off loose glitter. I used a super-soft dry paintbrush, which worked great. Place a candle in the bottom of the holder and light the wick. Create a pattern with masking tape and apply Mod Podge and glitter only to the exposed areas. 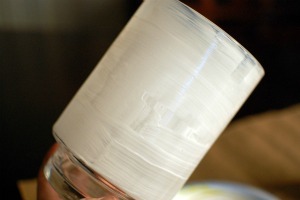 Allow to dry and remove the tape. Use those old florist vases that you have tucked away to create the perfect vase for spring flowers. 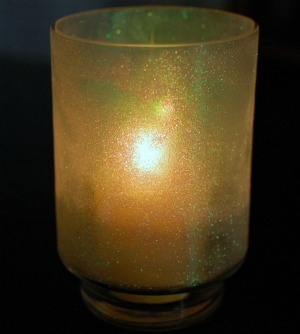 Play with different colours of glitter to complement your decor.